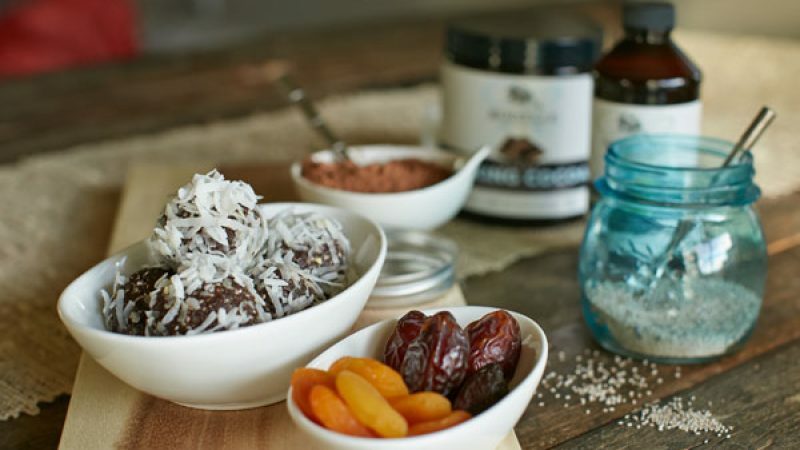 We know it’s hard to eat healthy all the time so we’ve created these no-bake cocoa bliss balls that are the perfect bite-sized snack and are still good for you! Soak the dates and apricots in warm water for 15 minutes to soften. Meanwhile, blend nuts in KitchenAid® Pro Line® Series 16-Cup Food Processor with Commercial-Style Dicing on high speed until they reach a fine crumb-meal texture. Remove nuts from processor bowl and set aside. Blend apricots and dates, Rodelle Gourmet Baking Cocoa, 1/4 cup shredded coconut, coconut oil, and chia seeds until it reaches a smooth texture. Add ground nuts and blend until combined. Remove mixture from processor. Using a tablespoon as a measure, roll into small balls. Place 1/4 cup shredded coconut into a small bowl. Coat formed balls in shredded coconut.